At first glance, sushi may seem far too fiddly to make with your five year-old but provided you're not trying to be a perfectionist about presentation, it's actually straightforward. Think they'll never eat it? Most kids like rice - especially sticky rice, which is very easy for little ones to scoop and eat - and most kids like cucumber and tuna mayo. If yours are having an 'off avocado' day, just leave it out, likewise you can switch tuna mayo for a little leftover roast chicken. These fillings may not be authentic Japanese but it's their lunch, make it their way and gradually introduce different ingredients. That's the beauty of sushi - you can make some entry-level, kiddie maki rolls without wasabi or raw tuna alongside extra, more traditional, versions for you. We think Japanese food is made for kids: little bento boxes, sushi trains, noodles, crispy tempura, savoury pancakes, bite-sized gyoza dumplings. Introduce it to them while they're young and by the time they're that bit older, they'll have upgraded to raw fish without blinking. Little kids like helping to measure out rice and roll sushi but it goes without saying that the sharp knife bits are strictly for you. 1. Cook the sushi rice according to pack instructions then leave to cool for 10 minutes. Season with the rice vinegar, sugar and salt. 2. While the rice is cooking and cooling, open the can of tuna, show the kids how to drain it and mix it with the mayonnaise in a bowl. Get them to snip up the spring onion with kitchen scissors and stir it into the tuna. Show them how to peel and de-stone the avocado and thinly slice this and the cucumber. 3. 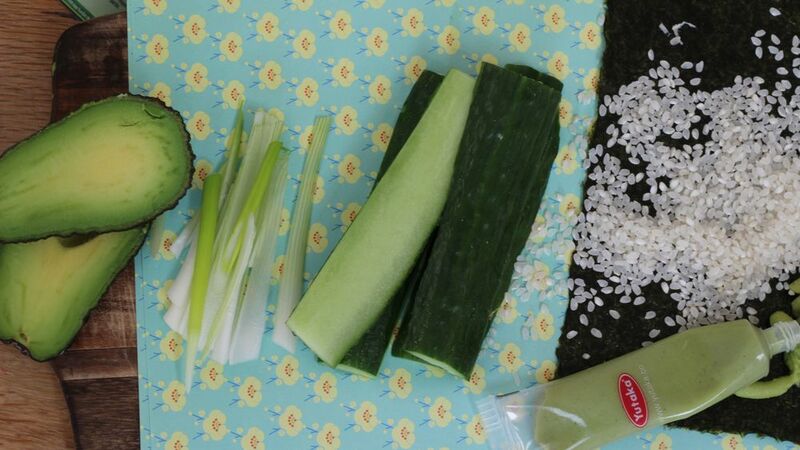 Take a sheet of nori and place on a bamboo rolling mat. Wet your hands and press half the rice over the sheet, leaving a 2.5cm strip without any rice at one end. Spread the wasabi along the rice, if using. Spoon half of the tuna mayonnaise along the rice and add strips of cucumber. Starting with the end covered in rice, roll the nori sheet up, using the mat to help you. Dampen the ends with a little water to help seal it in place. Slice into about five pieces. 4. Repeat step (3) with the second sheet of nori, using the remaining rice, tuna and the strips of avocado in place of the cucumber. For a visual guide to rolling the sushi, click here. Best served immediately but you can keep it in the fridge in a lunchbox and eat later the same day - just bring it up to room temperature before eating.